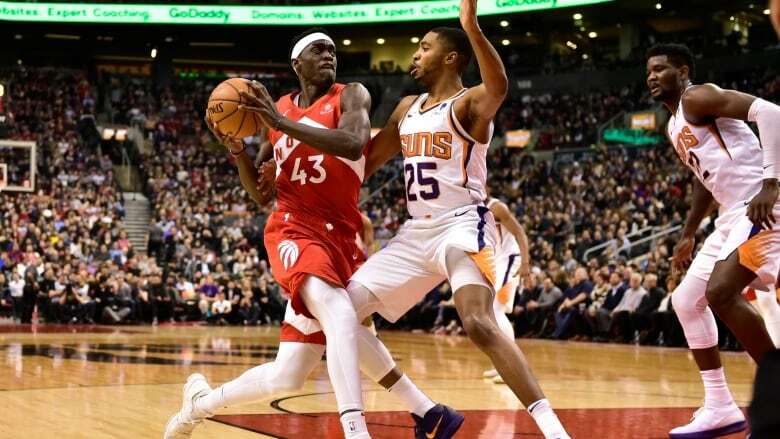 Pascal Siakam drove to the basket for the winning bucket with no time remaining as the Toronto Raptors, despite squandering an early 16-point lead, hung on to edge the Phoenix Suns 111-109 on Thursday. With Kawhi Leonard resting for the second game of a back-to-back, Toronto coach Nick Nurse elected to put the ball in Siakam's hands with 13 seconds left in a 109-109 tie with the Phoenix Suns. "He made a great move and finished it off," Nurse said after the 111-109 victory Thursday. "We call him P-Skills for a reason," added C.J. Miles. "He's got a lot of skills. There's a lot of things he can do with the basketball." "To be honest, I didn't know what I was going to do. I just had to make sure that I took the last shot," he said. "It was 'Pascal get the ball and get some spice a little bit,"' Siakam, wearing a T-shirt that said Hot Stuff, added with a laugh. Just who got the game ball remains a mystery. "I think Kyle stole it," said Siakam. "But that's cool. Kyle can have that." Asked if he had it, Lowry said: "Nah, I lost it." There was a basketball in his locker, however. A Toronto timeout set the stage for Siakam's heroics. He finished with 10 points and 12 rebounds. "Hell of a shot," said Phoenix coach Igor Kokoskov. Toronto (34-13) was without Leonard (rest), Jonas Valanciunas (thumb) and OG Anunoby (personal). They did not miss a thing of beauty but the matchup between the second and 27th-placed teams in the league proved to be far closer than expected. That loss snapped the Raptors' five-game win streak. But they kept another run going as they notched their eighth straight win at home since losing a 104-99 decision to Milwaukee on Dec. 9. It was also Toronto's sixth win in seven games, improving the Raptors' record to 7-2 in January. Phoenix's Josh Jackson was ejected in the fourth quarter for a second technical. 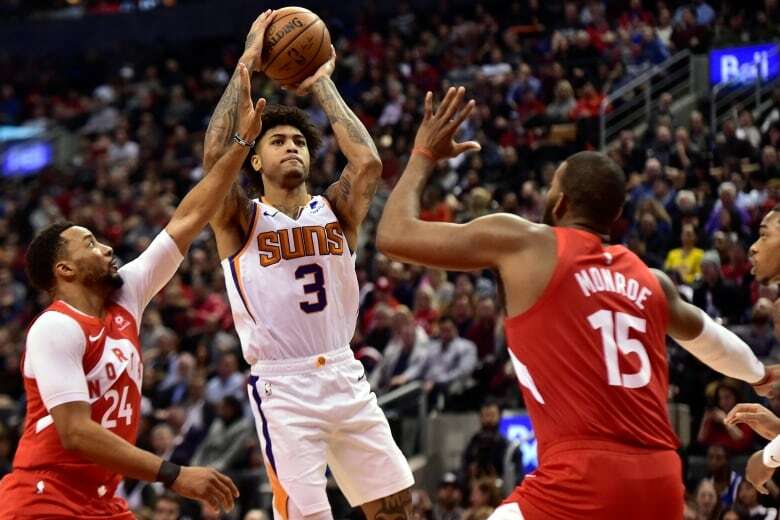 He had sparked the Suns offence with five points in the quarter, finishing with seven. The second technical came with a flagrant foul, allowing Toronto to run its lead to 92-87. The Raps retained possession and Lowry sank a three-pointer to rub salt into the wound in a 9-0 run. "I would have never thought I would have gotten there at the start of my career," said the 32-year-old Lowry, who is in his 13th NBA season. "I'll look back on this when I retire ... For now, it's a great day, a great team win for us." The Suns opened a four-game road trip with a 133-97 defeat in Indiana on Tuesday in a game that saw the Pacers lead by 37 at one point. The Suns have lost 11 of their last 14 and are a dismal 4-18 on the road. Patrick McCaw, signed a free agent Jan. 10, made his Raptors debut off the bench in the second quarter. He did not score in six minutes. It was the Raptors' 12th annual Canadian Armed Forces Appreciation night with more than 300 members of the military and their families in attendance. A pre-game presentation recognized Lieut.-Gen. Jean-Marc Lanthier, commander of the Canadian Army. Who's The Best Canadian Player in the NBA?